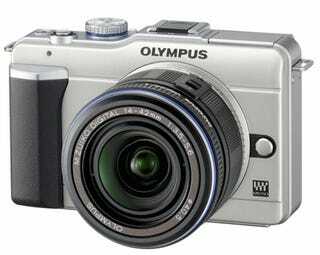 The third official Olympus PEN (excluding the originals, natch) has got official after the teaser campaign last week. The E-PL1 is $200 cheaper than the E-P1, but packs in the same 12.3-megapixel sensor and 14-42mm f3.5/5.6 zoom lens. - HD video recording (though as what resolution, Olympus hasn't said). As mentioned, it's $200 cheaper, at $599—which is great news. While the E-P1 was pretty decent (though I didn't hold onto mine for long) it was far too expensive for its own good. It'll be on sale in March, in Black, Champagne Gold and Slate Blue colors. ➢ 19 Scene-Select Modes: From portraits to sunset shots, the E-PL1 is equipped with 19 Scene-Select modes for effortless picture taking, including Fireworks, Sunset, Children, Macro and Panorama, to name a few. Capturing beautiful portraits is easy with the ePortrait Mode that enables you to smooth your subject's complexion. ➢ Intelligent Auto (iAuto) Mode: When you don't want to use the scene-select modes, the iAuto mode automatically identifies what you're shooting and adjusts settings for you to capture the best result depending on the situation. ➢ iEnhance: With this mode the warm yellow and orange colors of a sunset are heightened to a dramatically lifelike color that's truer to what you see with the naked eye. iEnhance can be used in any mode, and automatically engages when using iAuto to enrich color in any subject. ➢ Share: Just connect the camera to an HDTV with an optional HDMI cable and use your TV remote to control playback functions and navigate the camera's menus from the comfort of your personal front-row seat. The E-PL1 records to SDHC (Class 6 recommended) media cards that can be plugged directly into many devices and accommodate large files, including videos. The new camera's compact design makes it the perfect companion for all of your dive trips. The PT-EP01underwater case has been specially customized for the Olympus E-PL1 and is waterproof to a depth of 40 meters (approximately 130 feet). With its durable, high-quality polycarbonate construction, this Olympus housing protects the camera from water while also cushioning it from knocks and bumps on land. The housing enables viewing from either the camera's LCD screen or an optional electronic viewfinder. The flash connectors allow optional use of up to two UFL-2 underwater flash units via fiber optic cable. A nonremovable front lens port accommodates multiple Micro Four Thirds lenses. The E-PL1 streamlines the Olympus Micro Four Thirds PEN series form and is available in three new body colors, including Black, Champagne Gold and Slate Blue. Thanks to its compact size (4.51″ W x 2.84″ H x 1.63″ D excluding protrusions) and light 10.4-ounce body, the E-PL1 won't weigh you down when you're on the go.